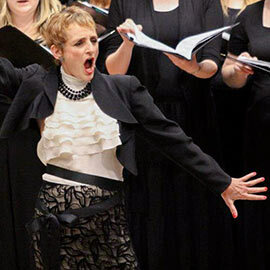 Laurier’s Faculty of Music is proud to present Voice Lab, a unique workshop for undergraduate and graduate-level singers who wish to pursue vocal studies beyond the fall and winter terms offered by most universities. This two-week intensive study period offers a unique opportunity to work on technique and repertoire on both an individual and group basis with highly experienced voice instructors and a collaborative pianist in an explorative and experiential manner. Within this framework is a broad palette of offerings to grow your artistic and musical self. Your studies can be tailored to ideally suit your needs, and there will be opportunity to share your work in both masterclass and performance settings, both on and off campus. Submit your $50 registration fee to Renée Ellis in office A513 or mailbox #22 upon submitting your registration form. Submit the remaining fee of Voice Lab to Renée Ellis in office A513 or mailbox #22 once accepted to the program. Cash or cheque online. Cheques can be made out ot Wilfrid Laurier University. Recitals will allow further opportunity for performance and the development of the vital relationship between soloist and accompanist.